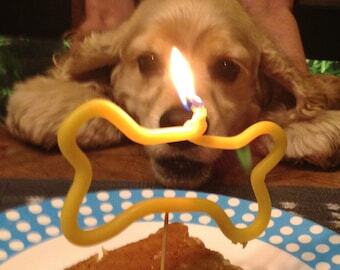 Announcement Lots of original birthday candles AND a bone for your pooch! Browse through the botanical soap and hand-dipped beeswax candles. Please do not hesitate to contact me for any info, wholesale, special orders and international shipping quotes. Lots of original birthday candles AND a bone for your pooch! Shipping was very quick and they were perfect. Candle was perfect. Thank you. I have been having fun with new braiding techniques, like this 8 strand Havdalah candle. Fresh lavender plucked from the garden. Hard to believe it survives a Montreal winter to bloom for us each summer. First market of the summer in Montreal! Mile-End candles are individually dipped in pure Quebec beeswax by hand, then twisted and formed into shape. All candles are wrapped in canvas and tied with jute. After spending too much time on my computer and in my head at university, I decided to explore my senses. I convinced my mom that "this is really what I want to do" and she gave me the 500 bucks to get started. Lured by the natural aromas, I started sniffing every soap and essential oil I could find and started my experiments. One kind oil supplier shared with me his mother's soap recipe, and I went on from there. I love the meditative, repetitive motion of dipping candles and the smell of melted beeswax lets my mind wander and wonder. Soap and candles are intimate objects, and I feel honoured to be a part of people's daily routines and special rituals. My candle designs are inspired by my kids, and my favourite thing to make is custom names. Etsy has given me the freedom to be at home with my 2 girls and 2 boys, and at the same time, build up my hobby and share it with people far and wide. A solitary nature girl at heart, I live and work in Montreal with Marc and our brood of 4 kids. Making soap and candles keeps me sane. Welcome to my shop. All my soap and candles are produced with devotion in my Montreal studio. If you would like to send a gift, please indicate this clearly with shipping address. U.S. - via Canada Post airmail, which takes between 6-9 business days. Canada - via Canada Post regular service which takes between 2-9 business days. ***Quebec and Ontario rates are slightly lower and can be shipped ExpressPost. Any shipping overcharge will be refunded. International - please convo me for rates. Combined shipping is possible and encouraged. Wholesale and custom orders are welcome.